Ogg Vorbis comment editor, encoder & decoder. 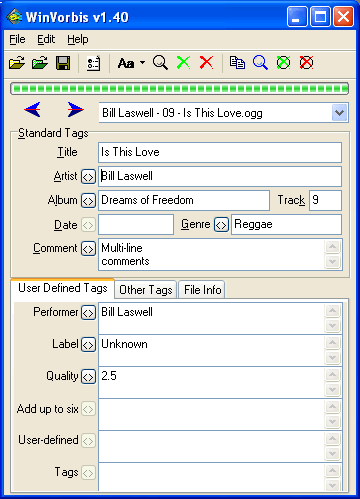 WinVorbis makes it easy to encode, enter and maintain tags for a whole CD. Features include: filename scanning; file rename templates; re-encode without loosing comments; alphabetical case conversion; UTF-8 unicode compliant; Replay Gain support; drag & drop from Windows; supports encoding from WAV, RAW, AIF, APE. Ogg Vorbis comment editor, encoder & decoder. Multiple File Scan templates may be setup to create tags automatically based on the filename. Multiple File Save templates may also be created to rename the files when saved. # Drag & drop from Windows. Qweas is providing links to WinVorbis 1.54 as a courtesy, and makes no representations regarding WinVorbis or any other applications or any information related thereto. Any questions, complaints or claims regarding this application WinVorbis 1.54 must be directed to the appropriate software vendor. You may click the publisher link of WinVorbis on the top of this page to get more details about the vendor.